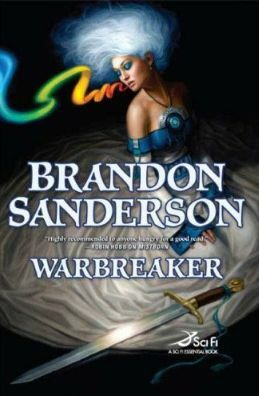 "Warbreaker" is another standalone novel written by Sanderson. The main story features two sisters, one of whom is sent to a hostile nation to be married to its leader, the god king. Ignoring old traditions, a younger sister is sent to fulfill this role, and soon the older one follows her secretly, intending to free her. As always, magic plays a significant part in Sanderson's story. This time is revolves around the use of colors and bringing inanimate objects to life. The plot itself isn't complicated, but the author manages to present the political and religious systems in a very interesting way. I particularly liked the way he explored the way people rely on symbols and their representations, taking many aspects of their lives for granted without ever questioning them. The image of an almost omniscient god, who is in fact helpless and bound by the will of his worshipers, sends a strong message. Just like all other novels by this author I've read, the final twist caught me by surprise. I found the ending satisfying, despite some features of Sanderson's style that I don't really care for (such as frequent use of modern, colloquial, and too informal speech in some of the dialogues).